Since the establishment of MMCWA in 1991, four main welfare services: health; education; social & economic, were rendered to the public through the voluntary efforts of the members. MMCWA’s partnership with IPPF started since 1994. After many discussions and preparations,, sexual and reproductive health projects were launched since 2007. Community SRH activities for each project township is concentrated on one of the 5A strategic components of IPPF. 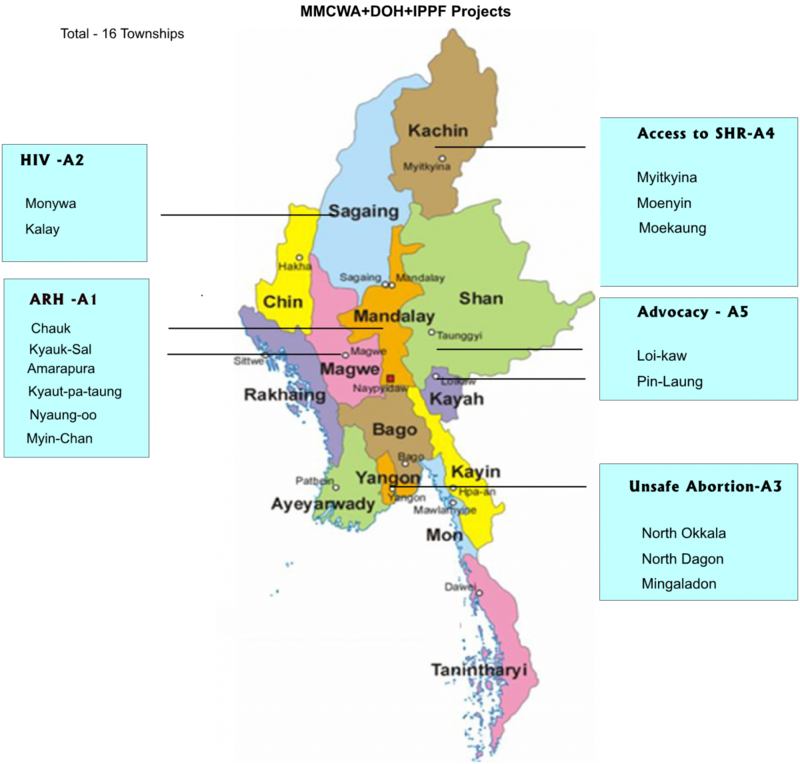 Close collaboration and assistance of IPPF-East, Southeast Asia and Oceania Regional Office(ESEAOR) makes MMCWA, one of the major SRH service contributing association among 26 regional services of the region. MMCWA’s 134 maternity homes serve as static stations for perinatal care, deliveries , family planning services. Simple pediatric and medical care and SRH promotion activities while mobile clinics stretched into the grass roots. We deeply convinced that the status of sexual and reproductive health and rights (SRHR) of the people collectively ,is one of the major development goals for the country and also recognize that everyone’s SRHR behavior is unique and individualized. By breaking the SES barriers, everyone deserves informed choices for their SRH preferences and these choices must be healthy and easier ones for them to be adhered once and forever. Most importantly, such SRHR promotion activities must be services without judging their backgrounds, ideology, ethnicity, race, religion or personal preferences.